Many artists I follow do convention reviews. I find them very helpful when I'm scoping out potential future conventions to sign up for so I figured I'd do the same, starting with ShutoCon 2015. This convention was in March and it's now September. At the time I was very stressed out, but looking back on it's it's been one of the best conventions in terms of being artist friendly. ShutoCon has a history of being an artist first convention and it shows in every step of the planning. The rules for ShutoCon were pretty standard for most cons. The only one that stood out to me was the 50/50 rule. ShutoCon doesn't allow more than 50% fanart and encourages original art. Honestly, I think this really helped to artists who are trying to get more fo their own work out there as it forces attendees to step out of their usual fandoms and consider other items. The one thing I would have liked to be clearer was how the 50% was judged. I was unsure if it was 50% of the table's surface, 50% of the items in terms of numbers. Also what would happen if you brought 50/50, but your original art all sold and you were left with nothing but fanart? Sign up was first come first serve, but has since changed to juried with a 24 hour application period. It sold out very very quickly. Fortunately, I was waiting right at the time it opened to get in. I had no issues at all with sign up. All staff I spoke to were polite. The person who runs the con was fantastic and easily available to talk to. Staff regularly walked around the artist alley and security was kind about letting artists in when needed. Check in and set up were easy. I stayed in the connecting hotel so I carried my stuff across the skywalk and made my way to the hall with the artist alley. Checked in and got my badge and table number without any wait. There was probably an easier way to load in, but I was fine with carrying my stuff. Sales were good all weekend even though traffic seemed a bit lower than I'm used to with stretches of time with no one entering. There was always a big rush when they opened, around lunch time, and right before closing. I saw security walking around about every half an hour so I felt super safe. I had no thefts and no major issues that needed security, but if I had, they were easy to find. There was just enough space between tables to get out with only minor jostling of other people's displays and plenty of room behind the tables. There was even a food court set up in the corner for food breaks and a bathroom right across the hallway. It was very convenient. 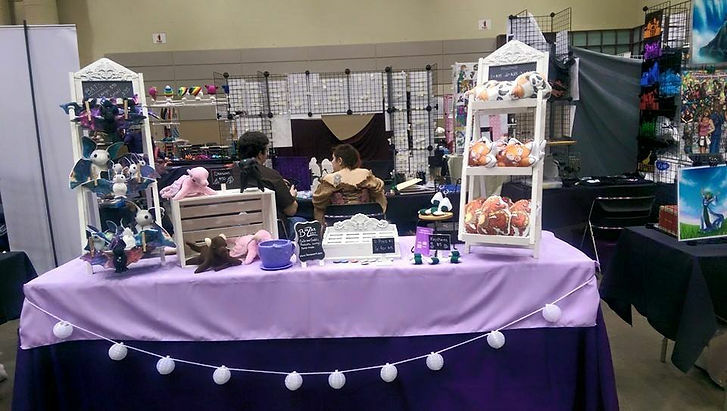 At one point in the convention someone even asked my mom (my table helper) if the spacing was good for us. She admitted that, with tails on our costumes, we would have liked a tiny bit more room without tables, but it was great all in all. We were both worried about being back to back with another artist, we've always been against a wall up until this point, but it was perfectly fine. The fact that con staff cared enough to ask artists personally what they thought was really great of them. Staff even bought items from artists to giveaway as prizes and took lots of business cards to give out. The one issue I did have with the weekend was the first night. I hadn't gotten much sleep since our roommates were noisy all night, which didn't make for a very nice first day for us. At closing time, there was still people wandering around the AA and more constantly coming in the doors. I wanted to get some "real food" in my belly and get some sleep, but the AA wasn't closing down. Eventually my mom went and told the door guard (who was just a volunteer) to tell people we were closed. They said they would, but people kept coming in anyway. Finally she positioned herself at the door and started confronting people for ignoring the volunteer as they were coming in. It probably took half an hour for staff to make an announcement that the alley was closed and even longer to clear it out so only vendors were left. However, the rest of the weekend went smoothly after that. Announcements were made prior to closing time that the alley was closing (1 hour, 30 minutes, 10 minutes, etc), an actual security member was placed at the door, and after closing time, staff members were checking badges and asking non-vendors to leave. I was very happy to see that our concerns were taken seriously the first night and huge steps were taken to correct the problem. It's probably the first time I've seen such direct action taken immediately because of artist complaints. In terms of sales, ShutoCon was wonderful and far outsold what I expected of a con that size. Though ShutCon has a 50/50 policy (50% fan art 50% original art) I chose to bring only original art except a few pokemon pins and one jolteon plush left over from last summer's conventions. The above photo is my table Saturday morning. 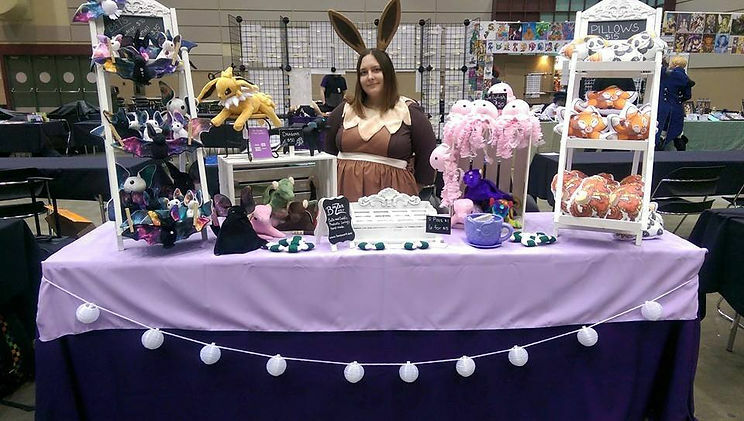 I sold out of all my jellyfish within the first few hours, a large number of bats, some dragons, and my jolteon. By the end of Saturday I had sold all of my bats except 1 larger one. Sunday I mostly sold printed pillows and pinback buttons and I even sold out of some designs of buttons. In terms of plushies, I came home with only 2 dragons and my printed pillow plushies and I chose to leave a bit early since my table was pitifully empty. 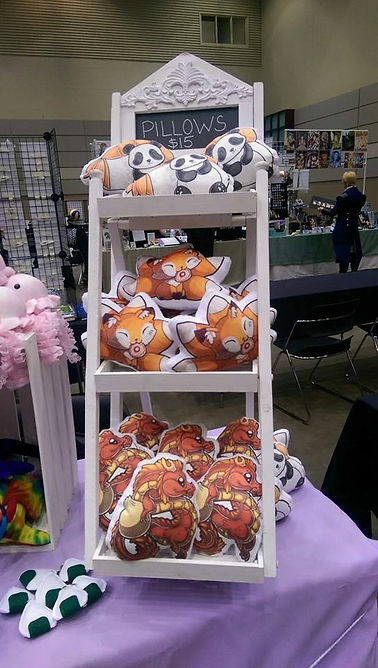 My printed pillows did not sell as well as I had hoped, but I don't have much to compare them to as this was my first time selling them at a convention. I did note that there were many other artists also selling printed pillows so it may have been there was just too much competition in that area for me personally. This was easy for me as I carried things in through the skywalk, I just carried them back out to my car. I did need to yell at attendees to move out of my way, but 2 women with giant bags and boxes plowing through the crowd got people to move quick enough. All in all I think ShutoCon was a really wonderful convention run by people who obviously really care about the artists and I highly recommend anyone considering it to give it a try some year. If I had brought more stock or brought fanart, I think I could have done even better. This is a convention I'd consider traveling out of state to attend, but maybe not one I'd fly to since it is still a smaller convention. I did not experience it as an attendee, but it is a favorite of many of my friends and they love the contests and opening/closing ceremonies.